An art show on Saturday marks the culmination of the year-long theme. What is the meaning of light and dark? The question is something members of the congregation at Raymond Community Village Church have pondered through worship activities for the last year. On June 4, they will hold an art show: the culmination of their exploration on the light and dark theme. The church on Main Street will feature a variety of artwork, including photographs, paintings, pottery and sculpture from local artists, all relating to the theme of light and dark. 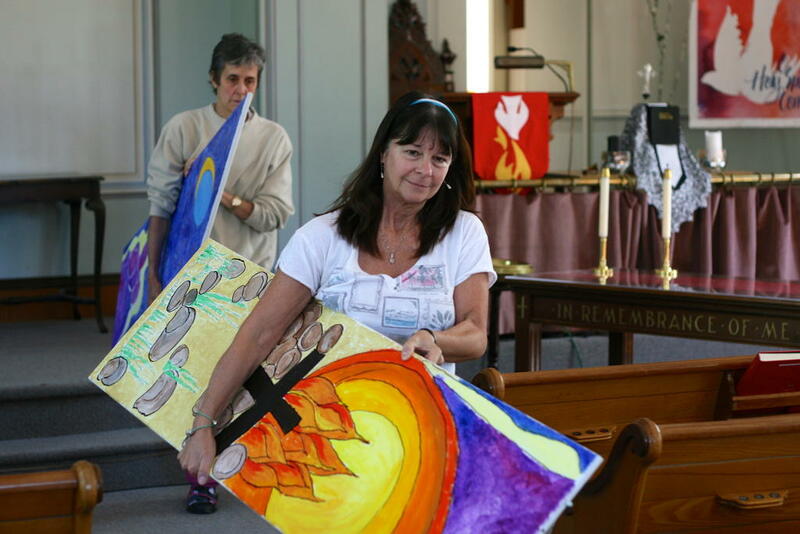 Windham High School students have submitted about a dozen pieces of art, Foran said, and many of the pieces are from members of the congregation. Lori Lambert, church secretary, has submitted two pieces: a garden of Eden painting she made as a child, and a photograph of her nephew as a newborn. The project started nearly a year ago, when a group from the congregation applied for a Vital Worship grant from the Calvin Institute for Christian Worship in Michigan. According to the Calvin Institute’s website, Raymond Community Village Church was one of 29 churches across the U.S. and Canada to receive the grant. The $12,000 grant has been used throughout the year to support the congregation’s activities in exploring the theme of light and dark. During the course of the exercise, the church has held three special worship services, including one at Casco Inn Residential Care Facility. Another piece of the project was to commission solid shutters to replace the slatted wood shutters in the church. The new shutters will allow the church to “have better control of the lighting in the space,” according to Foran. The shutters, which depict Biblical scenes on the theme of light and dark, were painted by the congregation with help from a local artist. Foran said the shutters stimulated a lot of discussion among the congregation. Starting a dialogue among members of the congregation, and opening up the church to the community have been some of the goals of the project since the beginning, Foran said. In developing the grant proposal, a small committee spoke with members of the congregation “about what was important in worship,” she said. The congregation said they were looking to bring in more visual experiences (“not just listening, which is what you do most of the time in church,” Foran said) and the group listened. In inviting the public to the church for the show, Foran said they are looking to connect with the local community in a different way. “If it’s a success, it’s something we look to expand overtime to become a real part of summers in the Lakes Region,” said Foran. “I’m looking forward to a good crowd of people coming through to look at the various pieces,” Lambert said. 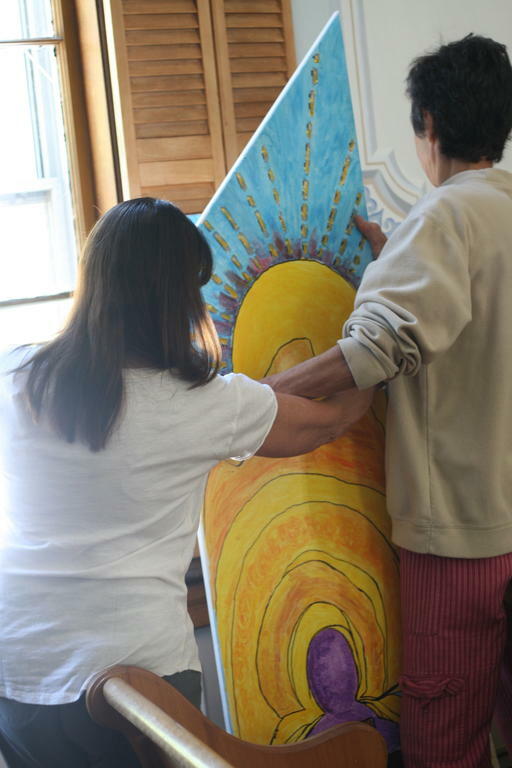 Lori Lambert, left, and Nancy Foran prepare one of the colorful shutters to be hung at the Raymond Community Village Church and dedicated this weekend. The church is hosting its first art show with the theme “light and dark” on June 4. Lori Lambert, front, and the Rev. Nancy Foran carry newly painted shutters for the Raymond Community Village Church.